South Shields Golf Club, established in 1893, is situated on coastal heathland, in the shadow of Cleadon water tower, a local landmark, which can be seen for miles around. At 6277 yards, the course provides a fair test of golf for players of all abilities. The course is noted for its fine greens, easy walking and magnificent views all round, particularly over the Tyne estuary, north to the Cheviot hills and south over Wearside to the Cleveland Hills. The course seldom closes due to excellent drainage through the limestone base on which it is built, ensuring good conditions underfoot throughout the year. Visitors are assured of a warm welcome and high quality catering in the clubhouse. 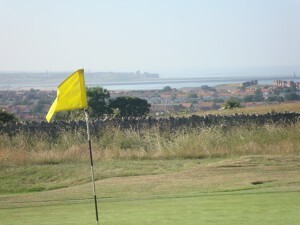 SOUTH SHIELDS GOLF CLUB was formed at a public meeting on 6th June 1893. 9 Holes were subsequently laid out on Cleadon Hills with a total yardage of 2540. The Official opening of the course was on 28th October 1893. In 1903/1904 the course was extended to eighteen holes, taking in land around the Mill on Cleadon Hills. In the years from 1922 to 1928, course alterations produced the current layout. To celebrate the Club’s centenary in 1993, a history of the Golf Club was produced by Mr. M. Byrne, a local schoolmaster. Limited copies of this booklet are available from the Manager. Thanks to Bill Allon for providing this facility.